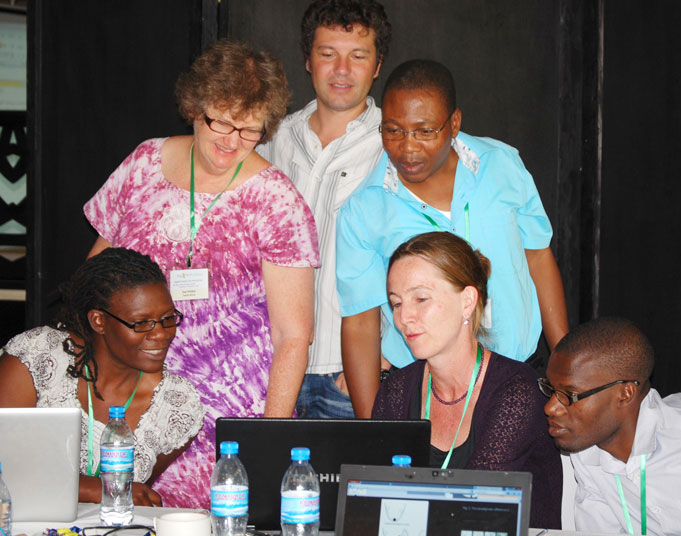 In late January of this year a much-anticipated workshop was held in Arusha, Tanzania. More than 150 researchers and stakeholders from 26 countries and 90 institutions across Sub-Saharan Africa and South Asia filled a large conference room at the Mount Meru Hotel. The attendees – members of regional agricultural research teams, representatives of their stakeholder groups, and experts in climate, crop, economic, and integrated modeling methodologies – gathered to share results from over two years of collaborative work. The teams are undertaking rigorous examinations of the big questions agricultural researchers and stakeholders must answer together to better understand and adapt for the variable and changing climate in the coming decades. What is the sensitivity of current agricultural production systems to climate change? What is the impact of climate change on future agricultural production systems? What are the benefits of climate change adaptations? The answers to these questions will guide policy decisions concerning the future of agriculture, assess agriculture’s vulnerability to climate change, and determine how regional food security will be impacted. Participants gather at the Mount Meru Hotel Arusha, Tanzania. The workshop was part of a targeted series convened by the Agricultural Modeling Intercomparison and Improvement Project (AgMIP) over the past 2 years to advance capabilities in regional integrated assessments. In order to develop and test the new methods, eight separate regional research projects in 21 countries in Sub-Saharan Africa and South Asia were formed along with two regional coordination teams funded by a grant from UK aid. AgMIP’s framework for integrated assessment incorporates an approach that links down-scaled climate data to crop and livestock simulation models and economic simulation models to characterize future distributions of production and associated outcomes. This approach is implemented in the Tradeoff Analysis Model for Multi-Dimensional Impact Assessment (TOA-MD). The TOA-MD has the capability of representing distributions of economic, environmental and social outcomes in heterogenous populations of farm households, going beyond the analyses that use averaged or aggregated data. Stakeholders can consider outcomes as they may be distributed across a given population, rather than as an ‘average’ condition. This provides information that policy and decision makers can use to develop specific strategies or adaptations for targeted groups. The TOA-MD can be used to assess how the distributions of outcomes are affected by proposed adaptation packages in plausible future socio-economic conditions. Jointly planned by coordination teams in each region, the workshops allowed co-development by regional investigators and AgMIP leaders of standardized methods for conducting the regional assessments using multiple models (see Guide for Regional Integrated Assessments: Handbook of Methods and Procedures, Version 5). This included delineation of requirements for new tools to link the climate, crop and economic models, which have been created and made available to the community. In Arusha the teams first presented an overview of findings to a combined audience of researchers and stakeholders. Next, they presented scientific and methodological details to attending experts across climate, crop and economic modeling research areas. Finally, they presented key messages in brief to attending planners and decision makers. Stakeholders from Pakistan listening to presentations by research teams. South Asia results featured Indo-Gangetic Basin rice-wheat cropping systems, Southern India rice-maize systems, Pakistan rice-wheat systems, and Sri Lankan rice systems. Sub-Saharan Africa results featured West African maize sorghum, millet, and peanut cropping systems, East African maize and wheat systems, Southern African maize, wheat, and sorghum systems, and Southern African crop-livestock farming systems. The research outputs vary according to region and model area. All teams found that the models predict increased temperatures due to climate change in the coming decades. There was more variability in the predictions of changes in precipitation, with some regions showing wetter futures and some drier. Most (but not all) also predicted climate change will have a negative affect on agriculture yields and livestock productivity, the amount of which varied between regions and farming systems. However many of the tested adaptations demonstrated that there may be viable options to reverse some of the projected yield losses. Because the assessments combined both biophysical climate and crop models with socio-economic models, the teams were able to present projections of regional economic winners and losers as a response to climate change. These projections utilized Representative Agricultural Pathways (RAPs) to account for economic factors incorporating variables such as population growth, income growth, technology changes, as well as trade, investment, energy, and agricultural policy. The teams then presented how tested adaptations to climate change could change the ratio of winners to losers and improve local farm incomes in the future. Stakeholder panel from Sub-Saharan Africa providing feedback after team presentations. After three days of intense scientific discussion among researchers, and a visit to farms in the neighboring Kilimanjaro area, the regional policy and decision-makers became the focus of the workshop. In plenary panel sessions stakeholders commented on findings, issues, needs of their communities, and priorities going forward. They then worked in teams with the researchers to discuss how decision-making happens, and to work through an exercise of advancing a policy brief from the main messages presented. Several of the stakeholders opted into special sessions with outreach experts aimed to understand which stakeholder communities would most likely be interested in AgMIP research. Stakeholders also met with AgMIP leaders to speak more specifically about their constituencies. Group photo of Arusha Workshop participants. The Arusha Workshop Report can be accessed here. Dr. Mboyi Mugendi, zonal director research and development, ministry of agriculture, food security and cooperatives, Northern Zone of Tanzania officially opened the AgMIP workshop. Members of the Southern Africa Livestock team at the Arusha Workshop. Community farm with mixed cropping and irrigation in Kilimanjaro region of Tanzania.